World-famous peaks, snug chalets and epic walks in Cradle Mountain. Growing up in Tasmania means I tend to be drawn to Tassie accommodation.. there are just so many beautiful locations, places to stay and wonderful pockets to explore and people need to know about them! And today it's Peppers Cradle Mountain Lodge - the closest accommodation to the spectacular Cradle Mountain-Lake St Clair National Park. Set in the wilderness are 86 private timber cabins, from contemporary Pencil Pine Cabins through to luxurious King Billy Suites. Each provides the modern comforts you would expect and some are appointed with spa baths. The King Billy Suites and Spa Suites have king-sized beds and can accommodate up to three guests utilising an additional roll away bed. There are also family cabins, some with spas, sleeping up to five people that can be booked directly at the Lodge. Be tempted by the delectable tastes of local Tasmanian cheeses over a glass of wine, have a romantic dinner, take a stroll on one of the 20 walking trails, wander through towering forests, gaze in awe at that trees older than mankind or indulge in a therapeutic massage or sauna. Pumphouse Point, a heritage listed former Hydro Station has been transformed into boutique accommodation 250m out on the picturesque Lake St Clair. Located within the Tasmanian Wilderness World Heritage Area, Lake St Clair is Australia’s deepest lake and forms part of the Cradle Mountain-Lake St Clair National Park. 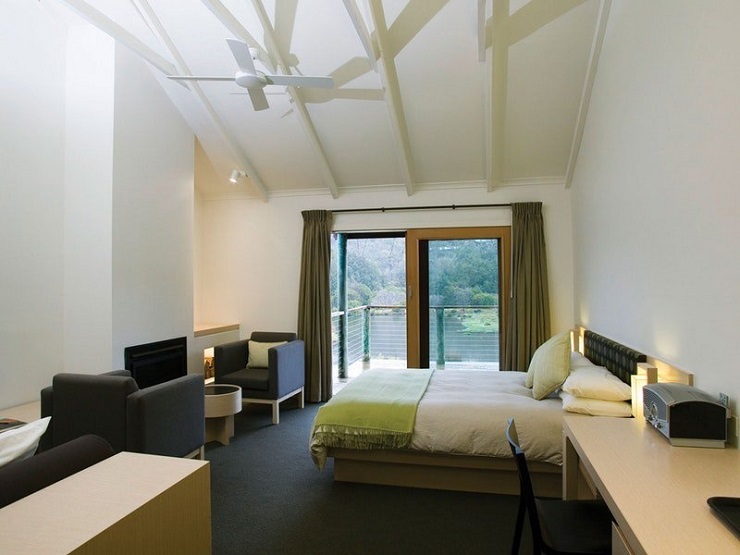 Rooms are spread over 3 levels with either a lake or landscape view, plush king size beds and Tasmanian timber features. Take time to relax in the communal lounge areas with help yourself bars and open fires, explore your surroundings by taking a bush-walk, a mountain bike ride or a spot of fishing... it really is a place to unwind, relax and immerse yourself in the beauty that surrounds you. Scrubby Bay, Annandale - a magical and isolated dream holiday location nestled in the picturesque Pigeon Bay on the New Zealand Coast. Surrounded by hills and completely private, Scrubby Bay is a luxurious cedar clad beach house that sleeps 14. A stunning pool, sun-drenched deck, ocean front spa, private pebble beach and a warm open plan living zone complete with roaring fireplace that is just inviting you to unwind and relax. A romantic luxury weekend away, a family holiday destination or a remote spot to enjoy with your friends - Scrubby Bay is the ideal spot to turn off, enjoy your surroundings and take in the beauty that nature has to offer. In Rajasthan, India, Aman-i-Khás, a camp of 10 canopied tents, is perched on the edge of Rajasthan's Ranthambore National Park - India's sanctuary for wildlife and natural beauty. The air-conditioned ‘tents’ have soaring six-metre-high canopies, elegant interiors, the most luxurious marble bath tubs and custom-made furniture, these tents are seriously divine – Glamping is the only word to describe them! Gorgeous soft cotton curtains divide the beautiful space into sleeping/bathing/lounging zones. And the hot tip is that tent number one is the most private as it’s set the furthest away from the main camp! Fall asleep in your king bed, listening to the calls of the wildlife. The Dining Tent cooks traditional Rajasthani cuisine, inspired by the royal kitchens of the Mughal emperors, with most meals created using vegetables and herbs grown in the camp's own organic garden. Lit by flickering candles at night, the Dining Tent has one large communal table and several smaller settings, but dinner is just as often served outside beside the roaring fire. The pool is a sight to be seen, a sparkling oasis in the middle of the wilderness, a place for relaxation and rejuvenation or just an afternoon spent on a sun lounger. And once you are feeling refreshed pop over to the Lounge Tent where there is a wide selection of novels, magazines, games, and music or the Spa Tent, where Massages and treatments are available. The fireplace is the camp's focal point, a large open plan and equally stunning space which is surrounded by cushioned banquettes for a relaxing evening taking in the stars, with a cocktail of course… afternoon G&Ts and post-dinner whiskies are poured in the Dining Tent and served around the fireplace each night.